When you are creating palettes, you may want to copy colour swatches or their values and paste them in other palettes to save time. 1. In the Colour view, select the colour to copy. 2. 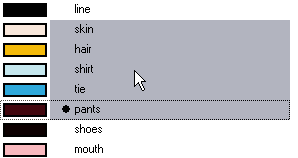 In the Colour View menu, select Colours > Copy or press [Ctrl] + [C] (Windows/Linux) or [⌘] + [C] (Mac OS X). 3. In the Palette list, select the palette in which you want to paste the colours. 4. In the Colour View menu, select Colours > Paste as New Colours or press [Ctrl] + [V] (Windows/Linux) or [⌘] + [V] (Mac OS X). select Colours > Paste as Values. In Toon Boom Harmony you can quickly copy a colour value from a palette in your scene to a selected colour swatch in a different palette. 1. In the Colour view, select the colour swatch you want to copy the colour into. 2. In the Colour View menu, select Colour > Copy Colour From, then select the palette where the colour you want to copy is listed and finally select the colour. The selected colour swatch will immediately change to this new colour.